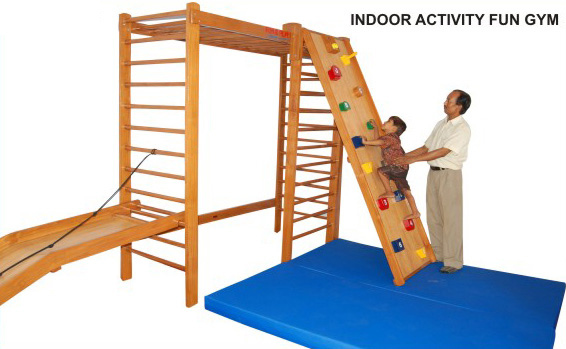 We have wide range of Sensory Motor for improving balance, hand-eye coordination and other perceptual motor functions. 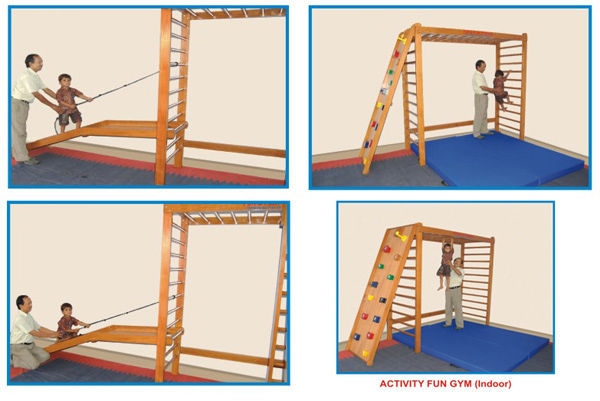 Activities at �Activity Fun Gym� aid the development of Arm & Shoulder Muscles in Children thus improving motor skills and coordination, also helps the children to develop Body awareness, co-operation Skills, balance skills, spatial awareness as well as affective & cognitive skills. This �Activity Fun Gym� combines all the classic favorites found on the Play ground and puts them inside your Facility. * Ramp & Roll System:	One, with Rope & one Padded Board with Wheels. * Climbing Wall: One, with 14 Hand Holds, can be fixed at different heights. * Frame Work: All the Ladders mentioned above are hardwood constructed With Oval-shaped rungs for better Grip-Hold. Unit is Provided with Two Wall Boards for fixing to the Wall. * Activity Mattresses (10cm Thick): Two, for Safety for the Children. Played like darts, dart ball set consist of Three plastics balls with velcro-hook strips, that when balls are thrown at a sturdy wall hanging target fitted with velcro-loop patches, ball stick to the target. Suitable for Eye-Hand Co-ordination. Reversable 6 feet (183cm) long sturdily constructed hardwood beam is covered with non-slip surface. Beam may be positioned so width is 75mm or 150mm. Top of beam is 15cm from the floor. Useful in early walking balance training. Wooden floor ladder with adjustable dividers, offers various walking patterns. Steps may be of equal size and alternately placed for right-left progression. *Material: Beams & Dividers made of Teak-wood. *Size: 96" long x 27" wide. *Finish: Beams finished in natural wood. Adjustable 16 Divider-bars finished in different enamel colours. Imported brightly single colored, inflatable, molded heavy duty vinyl ball can support upto 150kg. Indispensable aid for perceptual motor training activity, especially for children with abnormal reflexive reactions or for general exercises. Sizes Diameter of Balls approx. Available individually or in set. Seamless vinyl rolls cradle user in contoured "saddle" located between two ball-type ends. Rotation is limited to forward and backward, providing unparalleled control and security during balance activities. The board encourages rhythm, balance, coordination and vestibular responses. As children develop confidence, they can use it in kneeling or standing position. The recessed sides provide hand holds to eliminate pinched fingers. 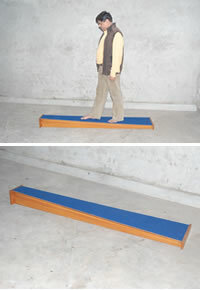 Foam cushioned top is nonslip, providing sure footing during rocker / balance exercises. Size: 45cm x 60cm x 15cm high. Rocking the body on board stimulates balance control with Vestibular Responses. Size 60"x30". The top is thickly upholstered and covered with rexine and washable fabric cover. 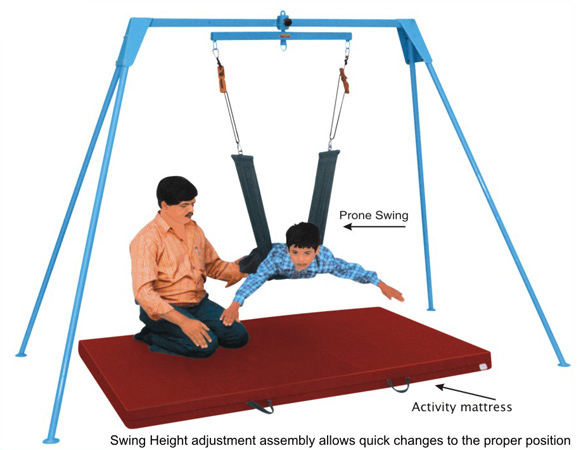 Vestibulator/Swing System provides a wide range of therapy modules for Vestibular,Neuro-developmental and Sensory Integration therapy. System provides vertical stimulation and direct flexion, linear acceleration, rotational experiences and complete range of motion exercises. It also incorporates 360 degree vertical rotation system for a smooth, unrestricted range of movement to create vertical & rotational stimulation at the same time. 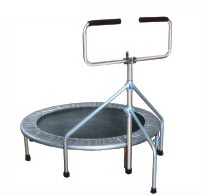 Durable metal frame with ball-bearing loaded Rotational Bar with suitable ropes & ascenders. 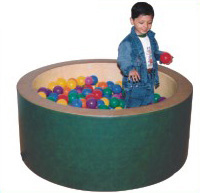 The dense foam padded mini Ball Pool is Soft,	safe and perfect for small children. It provides an excellent sensory stimulating activity. The	round pool is 120cm in diameter x 50cm high, & has 10cm thick padded sides. The pool contains 500 multi colour balls of 7cm or 8cm diameter. Pool side and bottom is covered with durable rexen that easily wipes clean. 1. Pinch Tree. 2. Pipe Assembly Unit PVC. 3. 25 Hole Peg Board. 4. Multi Shaped Peg Board. 5. Hand Tool Test Frame 6. 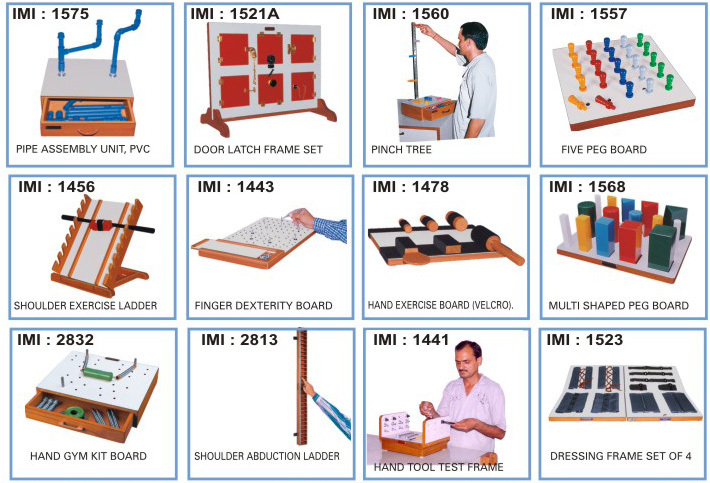 Finger Dexterity Board. 7. Door Latch Board. 8. Dressing Boards Set. 9. Shoulder Abd.Ladder. 10. Bilateral Shoul.Ladder. 11.Hand Exercise Board(Velcro). 12.Hand Gym Board. TWO, Drop-out doors converting into workspace. Lockable double doors for security. Sturdy construction with durable laminated work surfaces. A round laminated peg board with 25mm dia. holes is provided with 10 pegs with a step to hold tops. Pegs & Tops are painted in different colours. The unit is useful for eye-hand co-ordination, grip & finger hold exercises. Consisting of four 18"(45 cm) long wooden blocks each with ten inset knobbed cylinders graded in height and/or diameter. In block No.1 - the cylinder increases in both height and diameter. In block No.2 - Cylinder increases in diameter but remain constant in height. In block No.3 - Cylinder decreases in height but increases in diameter. In block No.4 - Cylinder increases in height while diameter remains constant. Manipulative for eye hand co-ordination and basic sorting skill. 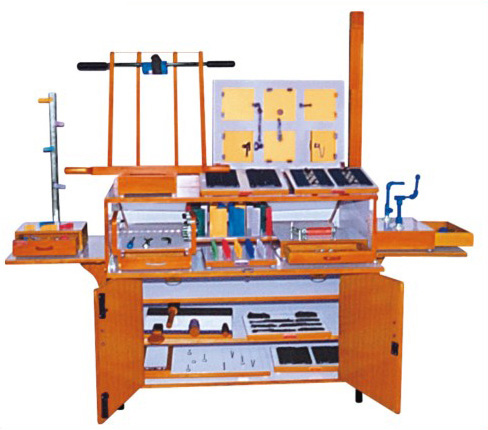 Laminated board of 30cm x 30cm size, is fitted with 4 posts on which to fit 4 sets of laminated and smoothly painted geometrical shapes of 20mm thickness. Comes with 4 each of Circle, Square, Rectangular and Triangle shapes. Measures an individuals basic level of function in the area of colour identification/grouping, movement of fingers, hand and arm. The laminated square board have 25 holes to hold smoothly finished 25 solid plastic pegs, in five different bright colours. Measures an individuals basic level of function in the area of colour identification, movement of fin-gers, hand and arm. The laminated board of 56 cm square size, have 100 holes, 10 in a line, to hold smoothly finished One Hundred solid plastic pegs, in Five different bright colour. A repetitive fine motor activity to facilitate prehension and coordination. Patient manipulate cloth pins & metal rings by attaching & removing them. 50cm high wooden post with pegs and storage box is a convenient way to build range of motion, arm, wrist, hand and finger proficiency. Square pegs are easier for the patient to handle but are slightly more difficult to place in holes. Laminated board has 25 square holes with Twenty 150mm high square pegs to fit in. Wooden pegs are painted in Four different colours. Useful for stimulating size and depth perception on advanced level. The 40 x 30cm laminated board has 25 square pegs of 25mm size. Five each graded in 5 heights. There are five rows of each size. Each size is painted in a different colour. Square pegs are easier for the patient to handle but are slightly more difficult to place in holes. The laminated board has 10 holes of different sizes of 20,25,30,35,40,45,50,55,60,65mm each and 150mm high square pegs to fit in. Wooden pegs are painted in five different colours. A primary laminated peg board with 25 holes of 25mm.dia and twenty 150 mm high round wooden pegs, painted in four different colours, to fit in. Can	be used by severely handicapped patients. Useful for stimulating size and depth perception on advanced level. The 40cm x 30cm laminated board	has 25 round pegs of 25mm size. Five each graded in	5 heights. There are five rows of each size. Each	size is painted in a different colour. Round Pegs are easier for the patient to handle & to place in holes. The laminated board has 10 holes of different sizes i.e. of 20,25,30,35,40,45,50,55,	60,& 65mm.The pegs are 150mm high and are painted in five different colours. Measures an individual's basic level of function in the area of colour identification, shapes & size discrimination. The multishaped peg board comes	with Five each of Round, Square & Triangular pegs in different sizes & diameters. Pegs are finished in different colours. Combines the manipulative experiences of a Pegboard with practice in Hand-Eye coordination, improves shoulder ROM and assists the development of grasp strength & tolerance. The mathematical puzzle creates interest and provide learning opportunity. 50mm thick and 107cm long, 10 Round and 10 Square pegs are easy to hold and place. Each peg is numbered & the client places the pegs in holes to solve the math puzzle. The peg board can be hanged on wall or placed on a table. A laminated board, fitted with 25 magnets of different resistances. Set comes with chrome plated 25 metal pegs, pegs are provided with different type of Grip and Finger holds. A therapeutic game that exercises grip hold, wrist & arm. The 30 cm.x 30cm. 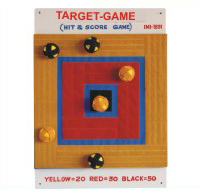 board is fitted with NINE magnets and comes with nine metallic pegs. Pegs are numbered from ONE to NINE for patients to play magic square games. Stimulates depth perception and eye-hand co-ordi-nation on two levels. Board is 30 cm.square and have 25 holes of 12 mm. dia. The board comes with 20 chrome plated solid iron rod pegs to place in. For perception of size without the factor of shape. Develops size constancy concept and sequen-tial placement of increasing size. Laminated board have FIVE different size circular cutouts with corresponding laminated inserts with knobs. For perception of size without the factor of shape. Develops size constancy concept and sequen-tial placement of increasing size. 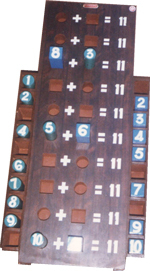 Board has five different square cutouts with corresponding inserts with knobs. An elementary introduction to perception of geometric shapes. Useful when intensive form perception practice is indicated. Board comes with Four basic laminated Geometric shapes in attractive colours. This ingenious 30 piece work set involves assembly of PVC pipes and fitting with a twisting motion. Tests ability to follow instructions and provides an excellent fine motor activity while increasing range-of-motion. Set includes wooden base with drawer for storage of Elbows, Tee, Sockets & Pipes. 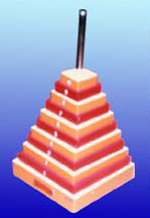 By stacking different sizes of Ten laminated Round blocks of 20 mm thickness on a 30 cm high metallic	central peg a Pyramid is formed. It develops size	consistency, concept and sequential placement of	decreasing size. Also helps in elbow and shoulder	exercises. Size: 25cm high wooden, painted. Also available in Square, Triangular, Hexagonal & Rhombus. 54 mm (10") high wooden, painted. Perfect for strengthening & coordination exercises. This unit encourages balance and muscular control even in an uncoordinated child. Unique construction	absorbs shock of bounce and grip handle eliminates the fear of losing balance or falling. Children can perform various body-posture exercises while bouncing, encouraging confidence and a feeling of success. Platform is approx. 120cm in diameter. Designed to eliminate annoying spilling over of food from plate.Constructed of stainless steel with spring action to hold guard to plate. The button hook meet most buttoning needs, dial for those who lack fine motor coordination or have use of only one hand. Button hooks are easy to use; simply slip wire hooks through buttons hole, grab button with wire and pull button back through hole. Made of durable, 25mm-wide nylon webbing with a pocket to hold spoon or fork. Velcro closure makes it easy to slip on and off and adjusts to hand. Made out of stainless steel sheet to hold a glass, welded U bent handle provides an easy grip hold for the patient with open fingers / hand. A clip made out of stainless steel sheet with resting supports that rest on the edges of a glass and has bent round tubing to hold the straw for drinking purposes. AMP-031866 : LONG HANDLES BRUSHES AND COMBS. Great for people with limited arm and hand movement. Anti Slip handles are ergonomically designed to fit against user's entire palm. Contoured brush and comb are attractive and functional made of polypropylene. Sturdily constructed of aluminum with plastic fittings. A trigger operates a scalloped jaw. Grips gently but firmly both hard & soft objects. Will pick up small books, spectacles, coins etc.